“If ever there was an industry ripe for disruption – and in need of a tech overhaul – the automotive industry it is.” – Bob O’Donnell, Founder and President, Technalysis Research. SINCE THE DAYS of the first Ford Model T, cars have come a long way. Modern cars have embraced new technological innovations that now offer improved steering, transmission system, safety gears, and GPS navigators for enhanced luxury and optimized performance. A third generation high-performance sedan now has more electrical function and computing power than an F-22 Raptor Stealth Fighter. 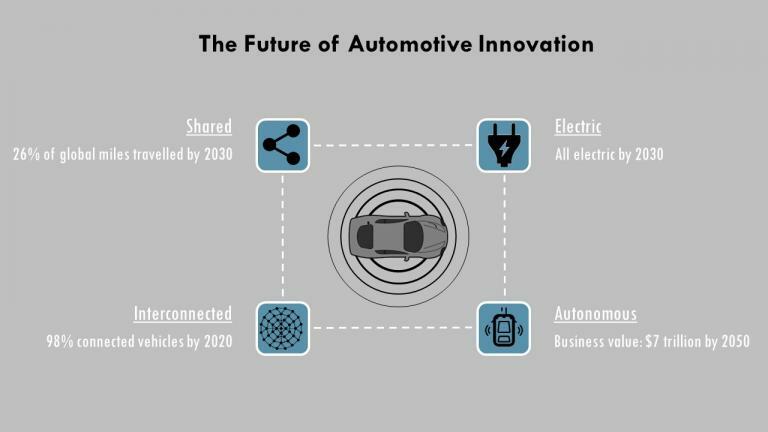 Despite the automotive industry’s disruptive growth, the biggest innovations are yet to come. Unlike the previous decades, the automotive world will open up newer industries and interest outside of conventional setup. The industry is already embracing automation in self-driving capabilities that are changing the entire commuting module. Shared devices and technologies are enabling easier access to luxury and vehicle sharing platforms are offering lesser travel expense and more convenience. Another biggest disruption is the prominence of hybrid and electric cars that are threatening the conventional fossil fuel industry and promising a safer land for the next generation. In a high-disruption scenario, the overall automotive market will hit $6.7 trillion by 2030. Among this, $4.0 will be coming from one-time vehicle sales, whereas in 2015 it was only $2.8 trillion. The aftermarket will be responsible for $1.2 trillion and new services will be generating $0.3 trillion revenues by 2030. In 2015, the numbers were respectively only $0.7 trillion and $ 3.5 trillion. Electric: Since concerns over climate change have tightened environmental regulations worldwide, many countries and major cities are aiming to put an end to gas and diesel cars on the road. Cities like Paris, Madrid, Athens, and Mexico City plan to go electric by 2025, Scotland sets the target by 2030, India 2032, France 2040 and UK by 2050. Global sales of gasoline-powered cars are already seeing a sharp decline while sales of Hybrid and electric cars are on the rise. If the current trend continues, hybrid cars will have the lion’s share by 2028 and electric cars will take over just after 2030. In just seven years since its IPO in 2010, Tesla was able to leapfrog Ford in market valuation. Electric vehicles (EV) are charging up for the green revolution. The global electric car inventory already surpassed 2 million in 2016. If this continues, the EV industry will see a steadily increasing rate of adoption, making up 41 million global sales by 2040 – about one-fourth of the total market share. One critical component of EV’s success is measured by the price of its battery. Over the past few years, prices of a battery pack have been slashed by nearly 80%. The same battery from 2008 worth $1,200/kWh could be bought for $200/kWh in 2016. Mass production will make them even more economical, driving up EV demand. Tesla is already ramping up the lithium-ion battery production through its newly established Tesla Gigafactory 1 in Nevada and alternative electricity production house (Gigafactory 2 / SolarCity) in New York. Parallel platforms (Gigafactory 3, 4 or 5) are also being constructed in Europe. Autonomous: By 2030, upto 70% of new cars sold could have self-driving features and 15% could be fully autonomous. In urbanized areas, self-driving cars can save time. On average, an American spends 212 hours on commuting annually. On the other hand, total commuting time autonomous cars can save 250 million hours annually. Autonomous cars can save lives also. 1.2 million fatal accidents occur every year – mainly due to human error. 585,000 lives could potentially be saved by driver-less cars. In addition, robot cars can save public expenditure upto $234 billion. Relieving people from the driver’s seat is revving up even more economic opportunity. The new “Passenger Economy” will represent an explosive growth trajectory: from $800 billion in 2035 to $7 trillion by 2050. Among this, $3.7 trillion will be coming from consumer end (on-demand transportation), $3 from the commercial platform (driverless delivery and business logistics) and $203 billion from new-use cases (healthcare, hospitality and service delivery). Big names in the automotive industry are already moving for automobile autonomy. General Motors (GM) has already acquired Cruise Automation – a California based autonomous driving technology producer that develops autopilot system for existing cars. Small firms and spin-off startup companies are spearheading in this aspect. One such software company is nuTonomy that develops software to develop self-driving cars and autonomous driverless robot taxies. Another autonomous driving and driver assistance system is Mobileye that provides a warning for collision prevention and mitigation. Currently, 13 different automakers are working with Mobileye to enable autonomous driving and more than 25 million vehicles worldwide are equipped with this technology. Such platforms are offering a flexible and modular system for mapping and motion planning, human-like maneuvering performance, autonomous decision making, and ride-hailing capabilities. These companies are collecting and analyzing petabytes to data to simulate the complex traffic scenario that human faces every day. Interconnected: Vehicles are increasingly being equipped with built-in network capacity. Direct data flow between cars and the wider infrastructure unlocks several possibilities such as ADAS (Advanced Driver Assistance System), real-time traffic updates, dynamic routing, and infotainments such as retail & business applications. Connectivity may come via tethered devices, smartphones, and embedded connections. In 2015, such connected vehicle was 35% of the total traffic; by 2020, it is projected to reach 98%. One such connectivity innovation is Tesla’s Seamless Integration. This digital touchscreen interface comes with an app that allows a driver to monitor and control the vehicle with a single swipe. Like Apple’s iOS system, the Tesla App can also get a periodic software upgrade. The innovations will soon be applied to the lower-end vehicles that will offer added features such as infotainment, diagnostic and analytical tools. Shared: Urban millennials are finding car ownership to be increasingly expensive and inefficient. Modern-day ride-sharing (multiple passengers in a single car) is dubbed as one of the greatest innovations of automotive service which has drastically cut excessive expense on the car. The cost per mile of a shared ride can be 40% cheaper than driving own car that may eliminate traffic and parking problem as well. As a result, ride-sharing as a mode of transportation is finding more support in big cities. Ride-sharing platforms such as Uber, Lyft, Didi and Grab are more popular than McDonald’s in many cities for their convenience, availability, and affordability. Although not ubiquitous, Uber has already shown a groundbreaking success. If Uber’s all trips were taken in the past 5 years are accumulated, the total distance is just over a round trip to Saturn! This $51-billion-dollar company has 8 million registered users worldwide. Another novel yet dynamic concept is vehicle-sharing (self-driving rental) where one car is used by many people. Car2Go, Zipcar, and Enterprise CarShare are such avant-garde platforms that provide commuter cars with segmented time allocation. Such platforms have proved both consumer friendly, economical and commercially profitable. Considering the win-win-win situation, established auto-makers are banking on the trend. GM has already invested $500 million on Lyft. Volkswagen has betted its $300 million on an innovative Israeli startup named Gett, that offers on-demand mobility service. For $65 million, Ford has acquired Chariot – a ride-sharing commuter shuttle service that focuses on enterprise customers. If combined, car-sharing can make up 26% of global miles traveled by 2030, compared to the current 6-7% share. Revenue in ride sharing segment is predicted to enjoy a 16% growth in 2022, amounting to $109,050 million. It is beyond doubt that, future cars will significantly accelerate the industry’s transition to sustainability through its brave new world of mobility service. The current automotive industry is experimenting with electric, hybrid, hydrogen fuel cell, and advanced self-driving apparatus and capabilities. Although the industry is lucrative, the automakers are taking baby steps to commercially launch the electric fleet. The automotive industry is being flexible, and flexible is what’s required for a truly disruptive industry in the future.